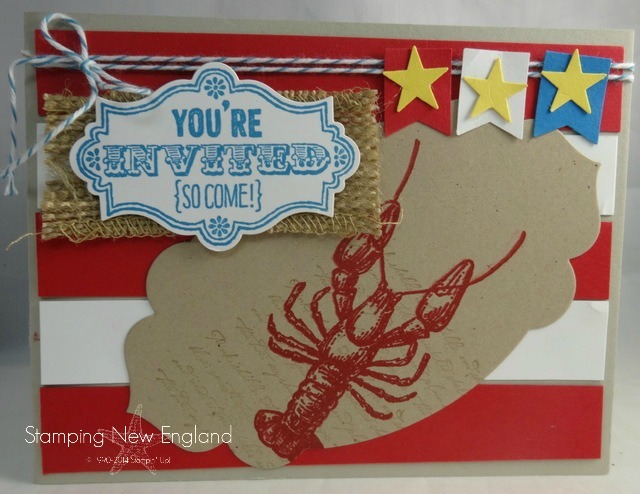 This is a card that I made for Stamping New England’s June Patriotic Class. I love this card and think that it is perfect for the 4th of July cookout!! The stamp set is By the Tide from the catalog stamped with Real Red ink on Crumb cake card stock. The image is cut out with the Apothecary Framelits. 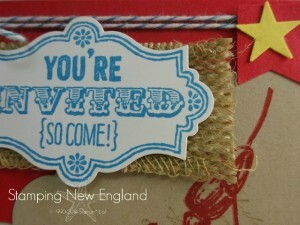 The “Your Invited” is stamped with Pacific Point and is from the Sketched Birthday stamp set. This is also cutout with the Apothecary Framelits. The background flag is made with scraps of real red and whisper white card stocks. The banner punch was used to punch out the little banner in the upper right corner. The star is from the Itty Bitty Accents punch pack. I hope that everyone has a fun and safe 4th of July! Here in New England, we are supposed to get hit by the tail end of hurricane Arthur Friday evening.